Okay, first, yeah, the eggplants were tiny. Like teeny tiny. They were literally the size of duck eggs, if they were even that big. I saw them in the grocery, and I was like, "Oh! Look at those adowaboo li'l eggplants! I gotta get 'em!" #4 daughter was coming to dinner, so I got three. I said to my husband, "I know you don't care for eggplant, but these are so wee, you'll hardly know you're eating one, right?" He's like, "Whatever." An additional attraction was the stickers they had on them. Hard to see the name, but the sticker has a dragon on it, and the brand is Asian Pride. 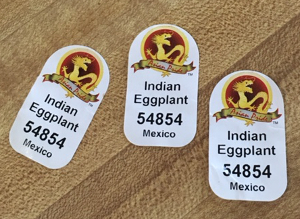 Asian Pride Indian Eggplant, product of Mexico. I ask you: Could I resist them? And Echo answers: No. 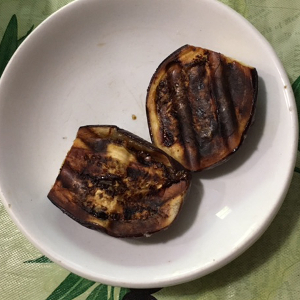 I cut each eggplant in half, smeared them with olive oil and Jane's Crazy Mixed-Up Salt, and put them in the George Foreman-style Rip-off Grill until they were blackened outside and creamy inside. This is a wee li'l saucer. I should have put a dime in there,to show scale, but I di'n'. And -- joy of joys! -- nobody else wanted theirs! Well, Charlie ate half of his, the dear man, but #4 Daughter, although a fan of Indian food, informed me that eggplant isn't a taste she cares for.